OutRight, EnGendeRights and Women and Media Collective partnered to tackle barriers to family violence and domestic violence protections for LGBTI communities. This resource is the presentation given during our trainer of trainer's workshops conducted at barangays in Quezon City, Philippines. Quezon City was selected as the pilot city to launch the project because it is the largest and most populated city in Metro Manila and the country’s first to have an anti-discrimination legislation (the Gender Fair Ordinance) that comes with specific rules and regulations for implementation, including guidelines to address LGBTI concerns. 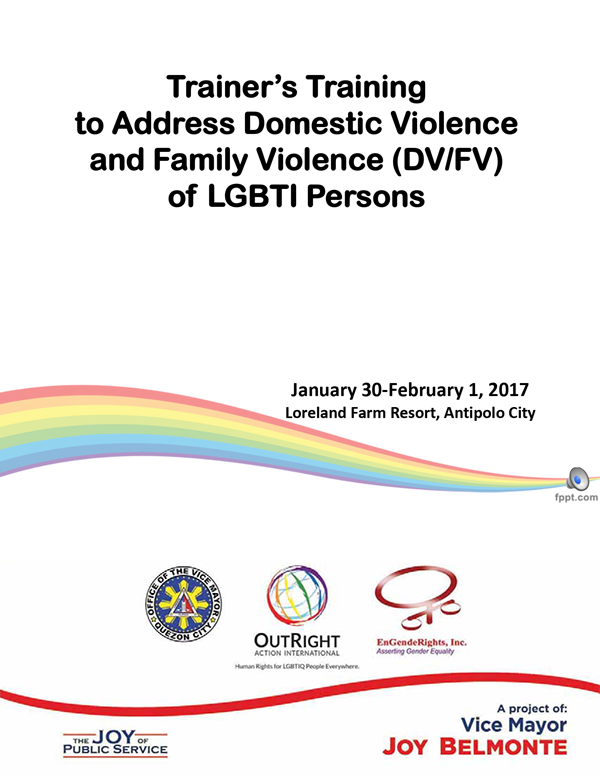 To capacitate with skills to provide sensitive and appropriate interventions and assistance to LGBTI persons who are victims of DV/FV.